The demands of everyday life can cause our posture to suffer, leading to the slouching and slumping that causes back, shoulder and neck pain. The Body Partner Spine Align Posture T-Shirt has been designed to condition your body to maintain a proper posture, helping to alleviate the common aches and pains that poor posture can cause. By providing your body with perfect posture when the t-shirt is on, muscle memory is enhanced, leading to the promotion of proper posture when the shirt is removed. This t-shirt is available in seven sizes. Select your desired size using the drop-down menu at the top of the page. It's no secret that poor posture leads to back, neck and shoulder pain, as countless people in the UK suffer from these conditions as a result of slouching, slumping or improper lifting form. After three years of painstaking research, the Body Partner team developed the ideal shirt design to help promote proper posture and reduce posture-related pain. By wearing the Body Partner Spine Align Posture T-Shirt, your body will learn the correct posture for sitting, standing and moving in a healthier position. After wearing the shirt, your muscles will remember the correct postural position, leading to maintenance of proper posture through all your daily tasks. How Should I Wear the Body Partner T-Shirt? As it may take your body some time to get used to assisted proper posture, we would recommend gradually increasing the time you wear your posture corrector, starting with one hour at a time. To avoid muscle fatigue and ache, we would recommend that you wear your Body Partner for no more than four hours at a time. The tasks we carry out in our occupations are often a leading cause of poor posture, whether they involve repetitive lifting, or hours slouched over a keyboard. This t-shirt includes a restrictive band that wraps around the shoulders, reminding the muscles to avoid the forward drop and roll that causes head and neck slumping. This band works throughout the day to ensure your back is straight, healthy and pain-free. Without good posture, sporting performance is diminished, and exercise can actually be doing more harm than good. 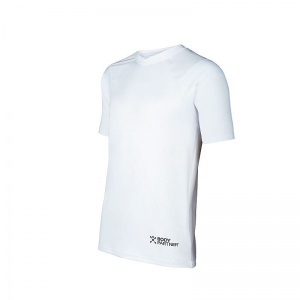 The posture that this shirt promotes helps to make movements more efficient, leading to less wasted energy, better performance and a reduced risk of injury. 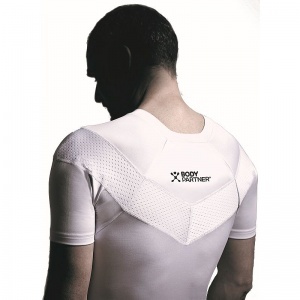 Whether you wear the Body Partner Spine Align Posture T-Shirt during your work day, or while playing sports, the postural maintenance it provides will help you in all the movements you make. The Spine Align Posture T-Shirt is available in seven sizes, corresponding to European standard sizes. We recommend that you choose the smallest comfortable size for maximum efficacy.